Data from Cassini’s last orbits, even up to its last gasps as it plunged into Saturn on September 15, are not supporting long ages. Astrobiology Magazine reported “fresh findings from Cassini” yesterday, based on a JPL press release. Several findings touch on the issue of age: can phenomena at Saturn survive for billions of years? Moon resonance theories allow for moons to absorb some of the angular momentum. The question is whether this delicate arrangement could survive for billions of years. The answer is not helped by personification fallacies, like that of Radwan Tajeddine, who quipped, “All of these moons work as a group to contain the ring. Together they are strong. United they stand.” Moons couldn’t care less what happens. Moons and rings simply follow the forces that impinge on them. The point is that today we see their forces converging to constrain the A ring to a sharp edge, but could that persist for billions of years? Project scientist Linda Spilker goes with the flow of Tajeddine’s proposal of cooperating moons, saying, “If these moons weren’t working together, the A ring would have spread out over hundreds of millions of years” (New Scientist). That sounds like a long time until you realize that a hundred million years represents only 3% of the assumed age of the solar system, including Saturn. But instead of water, Cassini found a witch’s brew of chemicals, including methane, a molecule that could be carbon monoxide and more-complex molecules. The concentrations of these chemicals are highest around Saturn’s equator and at high altitudes, which suggests that the material is shedding off the planet’s rings. The article goes on to say that the particles were not predicted. If they are indeed coming from the rings, how long can the rings supply the molecules? By analyzing the types of materials that could be coming off the rings, Perry’s team concluded that they must be fragments of tiny dust particles, which measure just 1 to 10 nanometres across but are relatively heavy. When these particles spiralled off the rings and slammed into Cassini’s mass spectrometer, they shattered into smaller pieces. So there is “far more than just water around” in the upper atmosphere. 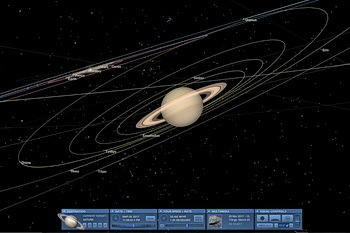 The density of infall from the rings must be extremely sparse, as evidenced by the fact that Cassini survived 22 high-dive orbits between Saturn and the rings. Nevertheless, 4.5 billion years is a long time for material to spiral out of the rings into a giant planet with a big, gravitational vacuum cleaner. Scientists are still struggling to keep Enceladus old. The geyser plumes found emanating from the little moon’s south pole were probably among the top 3 surprises Cassini found. At New Scientist, Leah Crane uses a string of double entendres to ask if the plumes resemble ‘astronaut pee’ vented from the international space station into space through nozzles. There’s probably more difference than similarity, one planetary scientist responds. The question of how Enceladus could eject 200 kg per second for billions of years looms over all such sideshows. Analysis of Cassini’s 635 GB of science data, collected over 13 years in orbit, will continue for years – perhaps decades. For instance, scientists are still analyzing molecules in Titan’s atmosphere from measurements taken in 2005 and thereafter (Phys.org). Already nearly 4,000 science papers have been published. Young scientists may get their PhD’s from Cassini’s data. Will any of them be able to keep Saturn, Titan, Enceladus and the rings billions of years old? If the ‘scenarios’ sound more and more contrived, that’s a sign they are desperate.